Typically, when one thinks of a flatbread restaurant, they think of an upscale version of a pizza joint. Maybe they think of a gastropub. I usually don't think of a minimalist, modern fine dining haven on Wilshire Blvd. in Beverly Hills, of all places. But then again, don't be fooled by the name; The Flats is definitely not just a flatbread restaurant. Described as a "sophisticated and fun dining experience with a focus on artisanal flat bread pizzas adorned with the best local, sustainable and humanely raised produce, meats and sea life available," this new restaurant is offering shared plates, house-cured meats, a great cocktail program, and oh yeah, some flatbreads too. Chef Kyle Schutte is marrying both local and more unusual ingredients, to create artistic dishes with surprising flavor profiles, making it a unique spot that satisfies customers looking for a casual pizza and high-brow foodies alike. As soon as you enter, you immediately recognize that this place is not your average pizza parlor. 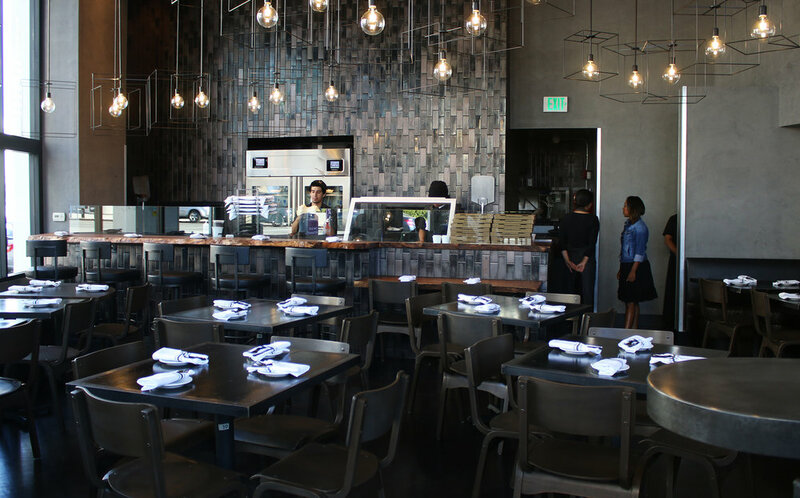 The space is industrial-modern, but minimally luxe, with wood tables, leather bar stools, and plenty of gray, silver, and metal accents. The bar, run by Pete Capella (from The Church Key and Black Market Liquor Bar to name a few), is fully stocked, with a smattering of seasonal cocktails (and a Rosé Slushee...hello Summer!). On this occasion, I opted for a simple Aperol Spritz, which was a lovely fresh, bubbly companion to the tasty food. We started off with the Fennel & Citrus "Salad," which was really unlike any salad I've had before. Instead of the typical bed of lettuce, the fennel and citrus were atop a beautiful bed of crunchy cornbread, which was sweet, crumbly, and totally delicious. Bits of fresh corn really made the dish pop, while the light & acidic fennel and citrus really popped. Mint oil provided another fresh flavor, while peanuts and honey added textural and flavor contrasts. There was also a little dollop of peach (?) sorbet, providing a cold, icy counterpoint to the warm, gooey cornbread. Overall, the dish was really delicious and so interesting. While I wouldn't call this a "salad" by any means, it was undoubtedly a great starter, and introduced us to the types of fine-dining flavors and creative combinations this restaurant is churning out. Next, the lamb carpaccio was another similarly interesting addition to the menu, with thin, flavorful slices of lamb with a cold dollop of frozen yogurt. Preserved lemon and mint added some nice fresh, summery flavors, while olive oil and black pepper grounded the dish. The warm, meaty lamb with the frozen yogurt was definitely a surprising but really satisfying combination. Though we could've run through the rest of their starters, trying out the "Bagel" and Lox Cannoli with house-cured salmon, aerated schmear, and apple or the Goat Cheese & Thyme Polenta with mushrooom consommé, fennel, tomato kimchi, and sorrel, we decided it was about time to move into the Flatbreads. They offer both "Old School" and "New School" Flats, so we opted for one of each. For the traditional choice, we went for the Meatball Flatbread with marinara, burrata, and pickled red onions. Though the combination is a classic, I loved the creative addition of the pickled red onion (such delicious little bites) and marigold. The meatballs themselves were really tender, flavorful, and juicy, while the marinara and burrata combination was a familiar but satisfying combination. The dough and crust are thin, but not insubstantial, so it doesn't fall apart but there isn't too much chew. Overall, it was a really delicious flatbread that was made very well, with clearly fresh and well-prepared ingredients. For our new school flatbread, we opted for the Duck Confit with carmelized red onion (yum), red wine pudding, and herbed goat cheese. Another great dish, I really loved the contrast of the sumptuous duck with the creamy goat cheese and the acidic pickled red cabbage. It was another very well-done flatbread, and I seriously enjoyed it. Finally, we finished off with an order of doughnuts. But of course, these were not your typical doughnuts-- instead, they were sprinkled with peanuts and accompanied by rose ice cream. It was another creative and interesting flavor combination that worked really well. Overall, we were pleasantly surprised by our dinner at The Flats. Every dish was very well-prepared, creative, and featured fresh ingredients. We were blown away by the creativity and fine-dining bent of some of the thought-provoking (yet delicious) dishes, but still enjoyed their simple and satisfying offerings as well. It's definitely a hard place to put your finger on, and doesn't really fall into any one dining category neatly. It's not simply a flatbread restaurant or pizza joint, and it's too casual for a fine dining spot. If I had to describe it in one sentence, I guess it fits in with the other modern, creative, shared plates restaurants taking over L.A., except this one just happens to focus on flatbreads. Either way, we would definitely come back!